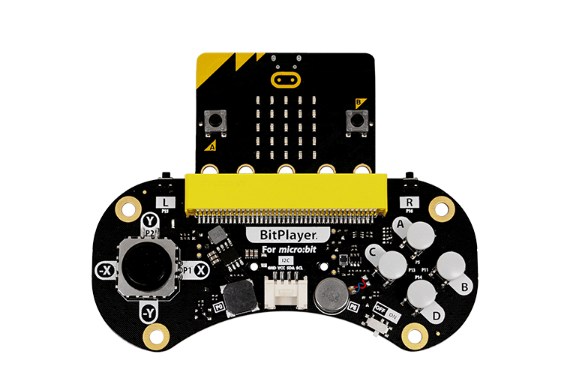 BitMaker is a credit card sized extension board designed for connecting micro:bit with Grove One modules. 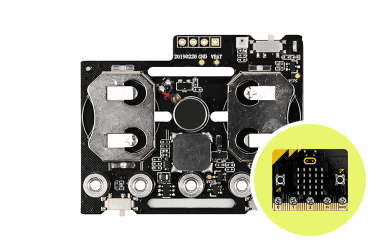 It acts as a bridge for micro:bit and our Grove One system, which provides hundreds of different Grove One modules including sensors, actuators, communication modules and displays etc., which will broaden micro:bit’s ability in creating more projects easily and quickly. 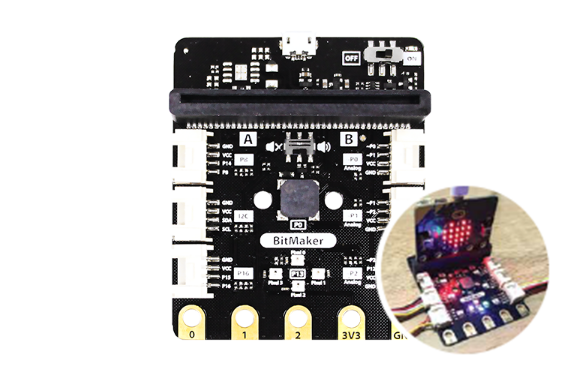 The BitMaker not only has as many as 6 Grove ports for Grove modules, it also integrates a buzzer and 4 neopixel RGB LEDs. The touchable pins P0, P1 and P2 are also reserved for connecting banana plugs or crocodile clips if you are a fan of making a fruit piano. * Fully support Microsoft MakeCode editor. 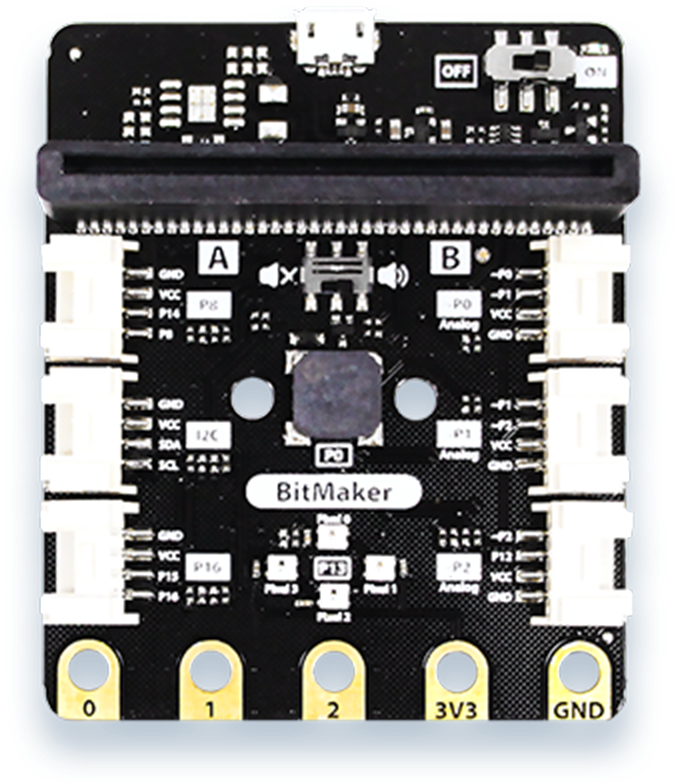 BitMaker Lite is a cheaper, smaller and more compact version of BitMaker. It has only 3 Grove ports, but it’s quite sufficient for many projects. 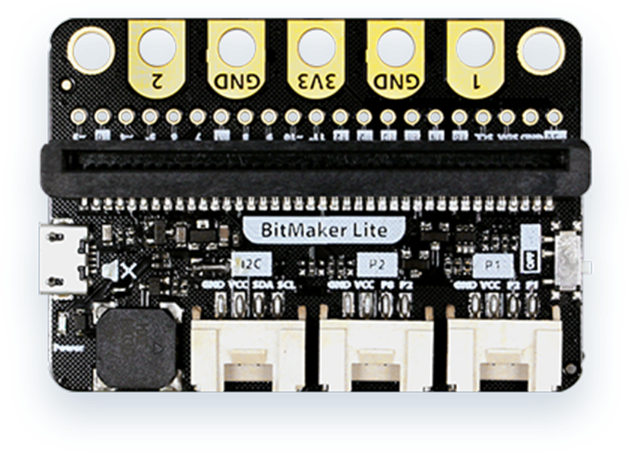 If you want to access more GPIOs, BitMaker Lite also provides breakouts of all available pins of micro:bit, you can solder header connectors to use them. 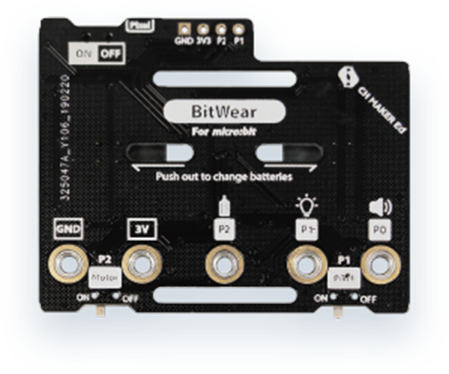 BitWear is an low-cost compact accessories for micro:bit users to make fun wearable gadgets. There are a vibration motor, a buzzer and an addressable RGB LED on board, all designed for your fun wearable projects. Simply power it with two CR3032 batteries, then you are ready to go. The board also allows you to turn off the motor and pixels with switches so you can use the touch pins or the breakout for other users. 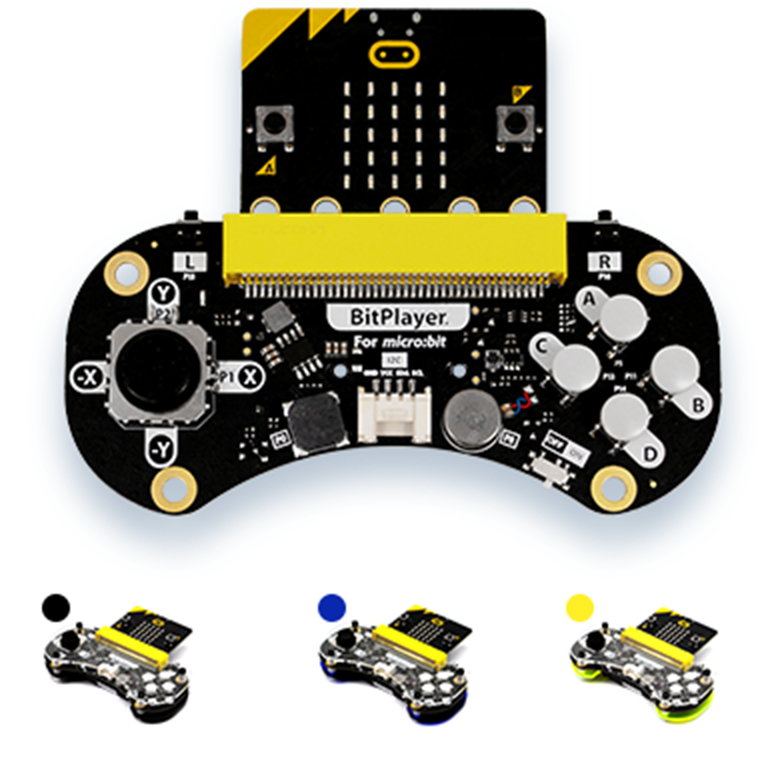 BitPlayer plus micro:bit, you just made a cool wireless remote controller and a game console for yourself. To provide a comfortable gaming experience, the product uses a 2-axis joystick that just feel like any joystick on a popular Gameboy or PSP. There are 6 programmable push-buttons, the top left, top right, and button A,B,C,D. With the built-in vibration motor and buzzer, you can get a quite immersive and interactive gaming experience. Some people may feel that the 5x5 led matrix is not enough for making games, so we have the I2C Grove port on board for Grove One peripherals like OLED Display. 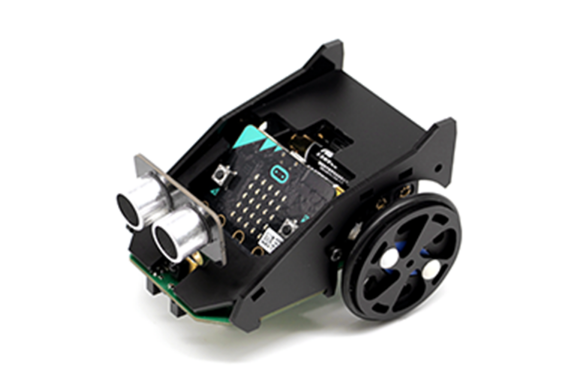 BitCar is a micro:bit based do-it-yourself robot designed for STEM education. It’s easy to assemble, easy to code and fun to play with. The car uses two high quality metal gear motors to drive the wheels, which have stronger force and longer lifespan than normal plastic gear motors. The car board integrates a buzzer for music or audio signals, 2 line follow sensors for tracking lines, and the 4 addressable LEDs on the bottom can be used as indicators, highlights or simply for cool decorations. 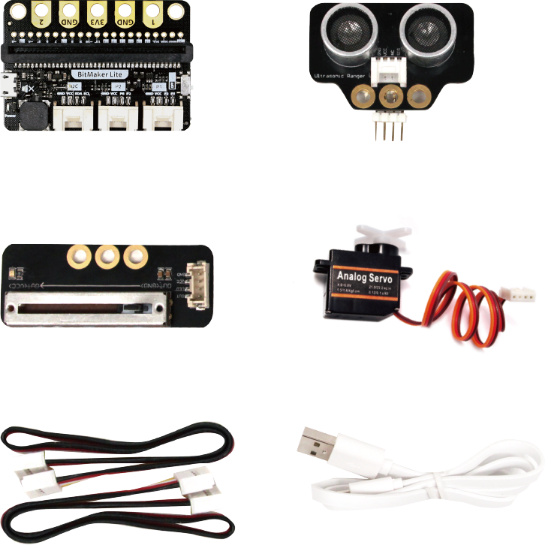 There are also Grove connectors for add-ons like ultrasonic sensor, AI camera, recognizer or screens. All features of BitCar can be easily controlled with Microsoft MakeCode editor. This kit includes a 22cm long, 20mm wide watch strap and a BitWear. 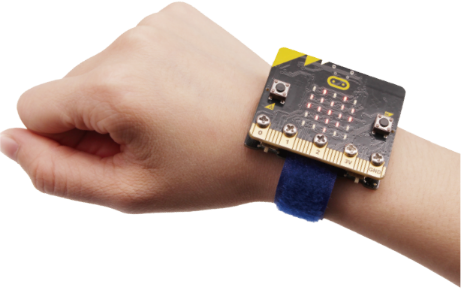 You can easily turn your micro:bit into a real watch! How cool is that! 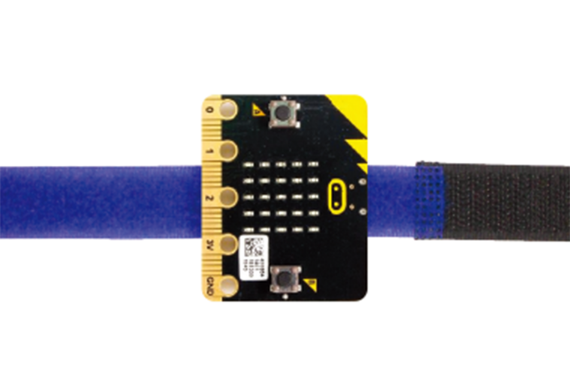 The strap is easy to use, simply slide one end of it through the buckle of BitWear, connect the BitWear to your micro:bit with screws, then you can strap your‘BitWatch’on your wrist like a regular watch. 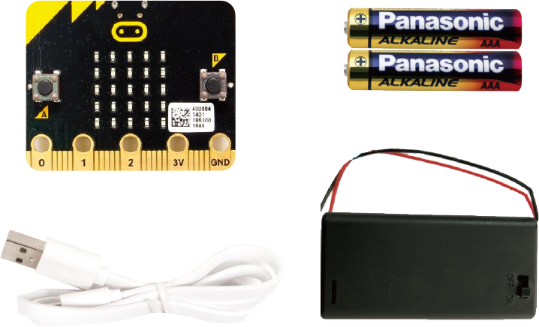 Program your micro:bit using Microsoft Makecode to make it display time or customized images. 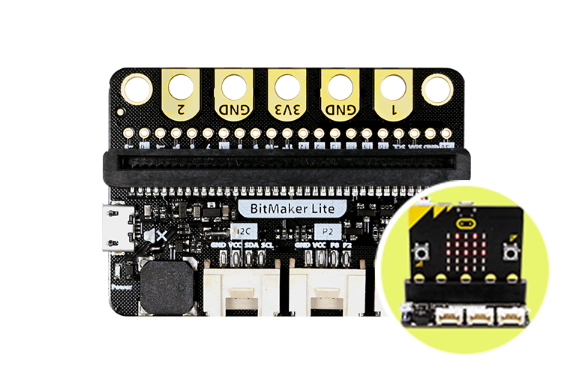 This kit includes 1 BitMaker Lite and 3 Grove modules. All modules are easy to use and fun to play with. The ultrasonic sensor can be used to measure distance and trigger the alarm if something approaches, while the slider can be used to control light or servo movement. 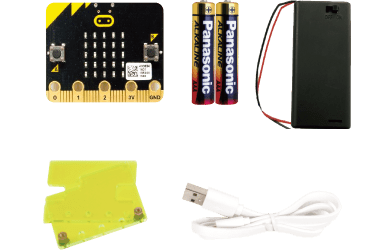 It’s suitable for beginners to explore fun projects and what they can achieve with micro:bit. 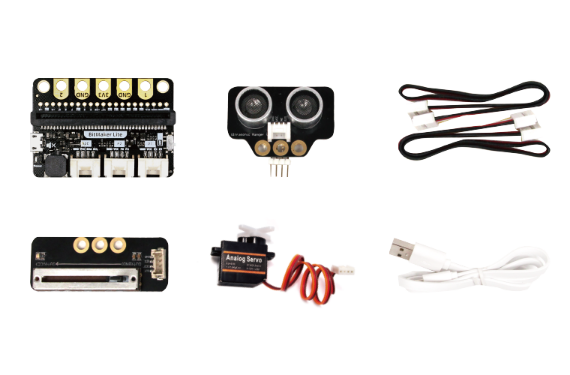 Sensors, motors, speaker and colorful lights, this kit includes everything you need to build fun cool micro:bit projects that shine, move and make sound. It includes a BitMaker and up to 7 different Grove modules. 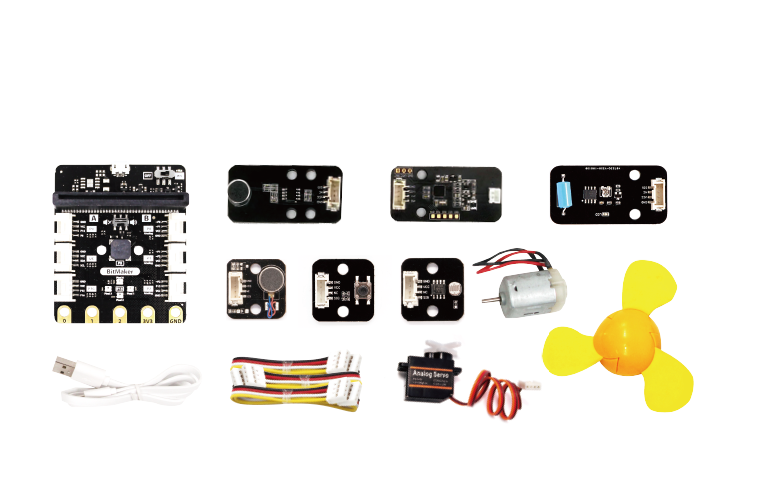 All modules are plug-n-play and easy to code with Microsoft MakeCode editor. 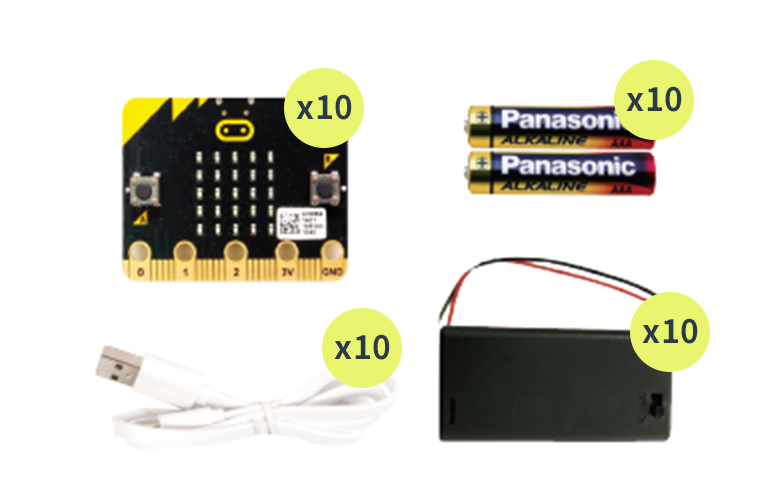 We’ve got packs that include everything you need to power or program your micro:bit. 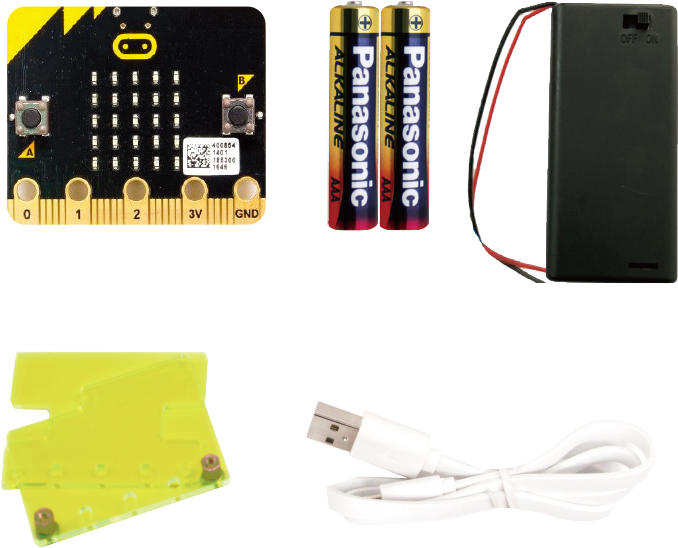 The BBC micro:bit Pack comes in three versions, The Basic Pack includes a micro:bit, a 500cm micro-USB cable, 2 AAA batteries and a battery holder with ON/OFF switch. The Standard Pack is pretty much the same as the basic version. 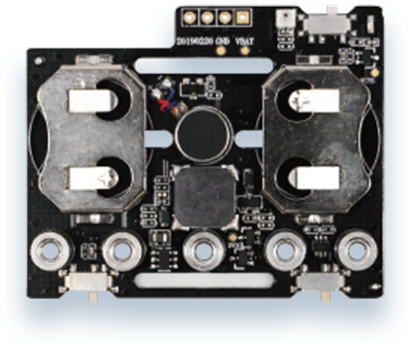 The only difference is that it also includes an acrylic protective case for micro:bit, which is nice to have if you want to keep your precious board away from unexpected accidents.